Kaspar graduated in 2016 with a bachelor's degree in ecology and evolutionary biology, and in environmental studies with a minor in atmospheric and oceanic sciences. While a sophomore, she joined the lab of ecology and evolutionary biology professor Michael Breed to work with then-doctoral student Chelsea Cook and became interested in organized behavior and responses to environmental stress. Building upon this behavior is Kaspar's finding that shows young nurse bees are influenced by seeing older, more experienced worker bees fanning their wings—also known as fanners. The younger nurse bees then join in to help regulate the hive's temperature. The fanners influenced the nurses' thermal response threshold and probability to fan, but most notably, fanners had the greatest influence when they were the initiators—the first to fan in the group. "The older workers are definitely influencing the younger nurse bees," Kaspar said. "I was interested in how different age groups socially interacted, what are the variances between age groups and how are they interacting to have a proper homeostatic response to environmental stressors." 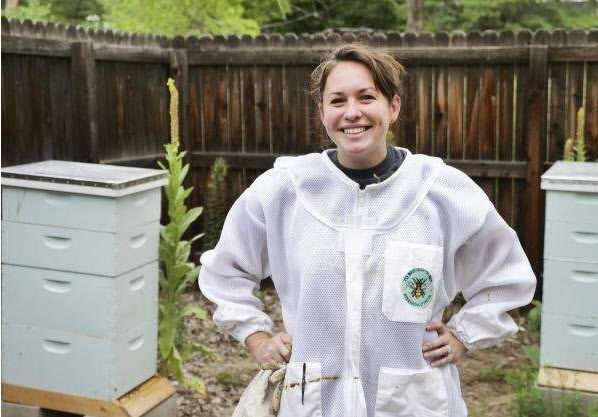 Credit: University of Colorado at BoulderHoneybees divide their tasks among female age groups. Nurses, who are between zero and 10 days old, take care of the larvae and the brood. Middle-aged worker bees, who are 10 to 20 days old, can be found on the front porch, as well as on the inside of the hive guarding and cleaning the hive, and fanning to cool the hive. The more outwardly visible bees are the foragers, which are 20–30 days old and fly from flower to flower collecting nectar and pollen. Researchers marked bees with water-soluble paint to identify them in the hive. When researchers warmed groups of bees, they would observe the bees' fanning behavior and record the temperature at which individuals and groups began to fan. "When I was down there with my face right in front of the hive, I could feel the air moving from their wings fanning," she said. "You would think that bees as insects wouldn't have the capability to learn, remember or have these social influences. But, in fact, they do. Bees are a great model to use for studying other societies, like us." "When I saw that I was shocked," she said. "This is exactly what I was studying in honeybees and there I was seeing it in people on campus." Kaspar is a professional research assistant in the Department of Anesthesiology at the CU Anschutz Medical Campus. She is working in Eric Clambey's laboratory, where they are identifying unique cell phenotypes and interactions in human lungs and the gastrointestinal tract to better understand the effect of micro-environments on viruses and inflammation. Her goal is to start graduate school in 2020 and continue her studies into how organisms come together to improve their chances of survival. "I love bees, though," she said. "I would very much like to continue studying honeybees in some way."